Contains type II collagen combined with growth factors. Developed to improve joint pain. As we grow older, bone and joint diseases become more frequent and there are fewer effective weapons with which to combat them. However, the discovery of bone morphogenetic proteins (BMP), which are naturally present in bones, represents a major advance. Our product is based on Bone Morphogenetic Proteins (BMO) which have been the subject of numerous studies since they were first discovered in the middle of the last century by orthopaedic surgeon Marshall Urist. His major discovery revealed that bone morphogenetic proteins induce regeneration of bone structure and cartilage. This involves an association between these proteins and specific stem cells, a type of cell widely studied for their therapeutic properties. Indeed, stem cells may offer treatment solutions for a number of diseases. The therapeutic applications of stem cells come from their self-renewal properties and capacity for cell differentiation. In other words, stem cells are undifferentiated cells which are infinitely able to self-renew and give rise to different types of specialised cells. They could thus be used to regenerate damaged organs and tissue. Paving the way for a number of therapeutic possibilities, the research findings on bone morphogenetic proteins and stem cells were published in the prestigious journal Science, under the title ‘Bone: formation by autoinduction’, a term which underlines the importance of this mechanism for bone regeneration. Indeed, the association of bone morphogenetic proteins and particular stem cells is responsible for the regeneration of the osteoarticular system – the regeneration of bones and cartilage. More specifically, the mechanism involves the differentiation of mesenchymal stem cells into osteoblasts, cells which promote bone formation, and chondrocytes, cells which enable the formation of new cartilage. 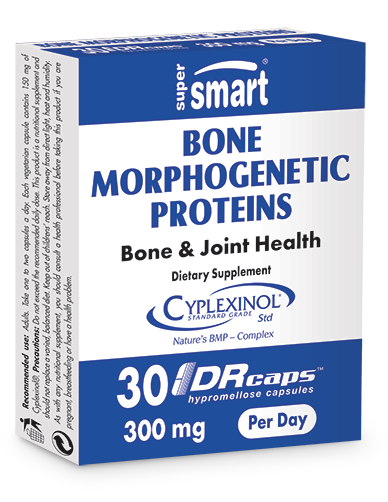 Based on the many studies into bone morphogenetic proteins, our dietary supplement is formulated from a patented protein-collagen complex called Cyplexinol. Developed in 2007, this complex contains natural bone morphogenetic proteins as well as other compounds that promote bone and cartilage regeneration. These include type II collagen and key growth factors such as TGF-Beta (transforming growth factor beta). Acting in synergy, the various compounds in Cyplexinol stimulate the regeneration of the osteoarticular system. With their key role in the regeneration of bone and cartilage, bone morphogenetic proteins offer significant benefits for reducing age-related joint pain as well as for preventing the development of certain bone or joint diseases. That is why a number of scientific studies are currently investigating the therapeutic properties of bone morphogenetic proteins and the use of the protein-collagen complex Cyplexinol. Some researchers are focusing on its potential for preventing arthritis, by helping to combat incapacitating pain in the back, knees and hips, while others are examining its possible use in treating osteoporosis. While the full potential of bone morphogenetic proteins has yet to be revealed, we already know they offer considerable benefits for improving joint comfort and combatting joint pain. In order to fully deliver these benefits, our dietary supplement contains a significant amount of bone morphogenetic proteins, as provided by the patented complex Cyplexinol. With 150mg of Cyplexinol per capsule, the suggested dose for our supplement is 1-2 capsules a day for adults. This dose can be adjusted in line with your needs and the advice of your therapist. The effects of our supplement Bone Morphogenetic Proteins can also be enhanced by other nutrients such as glucosamine, chondroitin, MSM, vitamin D3, magnesium or certain calcium salts. Adults. Take one to two capsules a day. Each capsule contains 150 mg Cyplexinol®.